Trillium (Lat. trilix, triple, the parts being in threes), a genus of North American plants, now placed in a suborder of the lily family. They are perennial herbs with a short tuberlike rootstock, from which rises a simple, naked stem, usually less than a foot high, bearing at its summit a whorl of three ovate or rhomboid, netted-veined leaves, above which is a terminal flower, usually large, succeeded by an ovate, purple or red, three-celled berry. The trilliums, of which there are about a dozen species, are among the most striking of our spring flowers; their symmetrical structure and the beauty of the flowers in most species are interesting and attractive; they grow in rich moist woods or bogs, some extending from Canada to Georgia, one being peculiar to the far southern states, and two or three to the Pacific coast. The plants have received various common names, among which are three-leaved nightshade, wakerobin, birth-root, bethroot, and Indian balm. The great-flowered trillium (T. grandiflorum) is the showiest species; its pure white flowers, often 3 in. across, and becoming rose-colored with age, are erect and raised above the leaves on a peduncle 2 to 3 in. long. The purple trillium (T. erectum) has rather smaller, dull purple flowers. The red-fruited species (T. erythro-carpum) has its white petals marked at the base with pink or purple stripes. 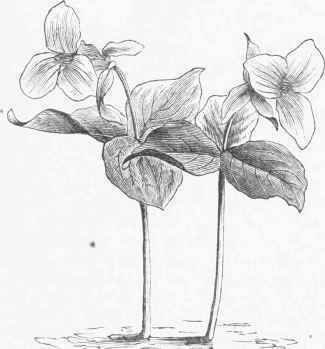 The nodding trillium hides its flowers beneath the leaves by the recurving of its stalk. T. sessile often has its leaves blotched with two shades of green; and the related T. discolor, the southern species, has very ornamental foliage from being variegated with green and brown or purple. All flourish well in the garden, T. grandiflorum being especially ornamental; large numbers of its tubers are sent to Europe, to be sold by the bulb dealers. The roots of trillium contain an acrid principle analogous to senegine and saponine, as well as a volatile oil, resin, and tannic acid. 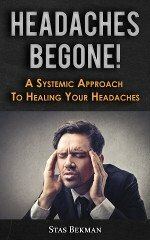 They are astringent, and are said to be tonic and expectorant.